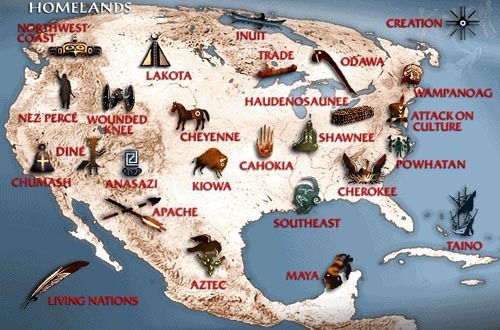 Newspaper Rock: John & Ken Show: America was "free land"
"The Euro-Americans ultimately won because they were better liars and cheaters, not better fighters." It's been discussed before, but of course there are other factors. Such as there being more Europeans (waves of new ones coming in from the East, but nothing comparable to shore up the dwindling Native numbers). And the Europeans had the bigger and better gun works. And there's good old bad luck. If Tecumseh's rebellion had built to be something enough to gather the interest and support of an anti-US foreign power, things might have been very different indeed. Also, there's disease. No matter how smart you are, how good your aim, how good your tecchnology *cough*Custerwasanidiot*cough*, disease is the most decisive factor in a clash of civilizations. And as you mentioned, Europeans were the Zergs. Anyway, no formalized ownership? Interesting concept. Formalized ownership and political boundaries aren't the same thing. Also, in the case of a lot of plains tribes, it's not that ownership didn't exist, just that to own something was unmanly. In communist countries, the entire nation is typically the personal plantation of the dictator and their family. These are actual communist countries, reaping the bloody harvest of the attempts to implement Marx's ideas.